Past OPCAAW President Russell Neyman presents 50 Nifty Shop Tips. There's something for everyone and turners of every experience level in this presentation. In addition, the meeting will feature announcements, Show and Tell and the wood auction. 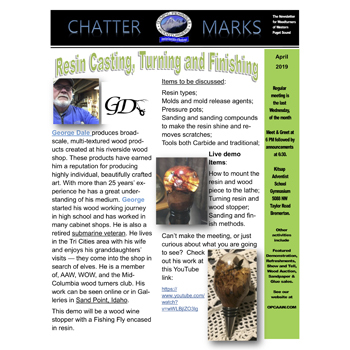 Members will also have access to our library and to sandpaper and CA glue sales. Gathering starts at 6 p.m. Announcements begin at 6:30.